The modem is an iPod-white box that measures a compact 8.7 x 4.1 x 1.3cm. Almost entirely feature-less - visually speaking - there's a status LED some way above the Vodafone logo, a mini USB port and a drawer in the side for the SIM. Unhooking the drawer is easy - just pull it out, slide the SIM into the drawer then put them both back in the device. Vodafone bundles a pair of transparent USB cables: both mini-to-maxi USB adaptors, though one cable sprouts a second large USB connector as a secondary power feed for folk with USB 1.1-equipped computers. The extra USB connector is on a rather short lead, so your USB ports can't be more than 9cm apart - a problem if you've one on one side of your notebook and the other on the far side. Installation is straightforward. I tested a pre-release model and had to download the Mac OS X drivers, but Vodafone assured me they will be included on a CD in the box. Windows users don't even need a CD - the modem has a read-only Flash disk on board which holds the drivers, using Windows' auto-run feature to install them automatically. On the Mac, the installer saves Vodafone's Mobile Connect app and the hardware drivers. After a restart, plug in the model, run Mobile Connect and the software will allow you to select the network you're connecting to - essentially to cater for roaming. Connections to Vodafone's 3G network are actually made using Apple's own Internet Connect utility - now pre-loaded with Vodafone's settings - much as you would with a dial-up modem or a Bluetooth-connected mobile phone. The Windows version of Mobile Connect operates as its own connection app. 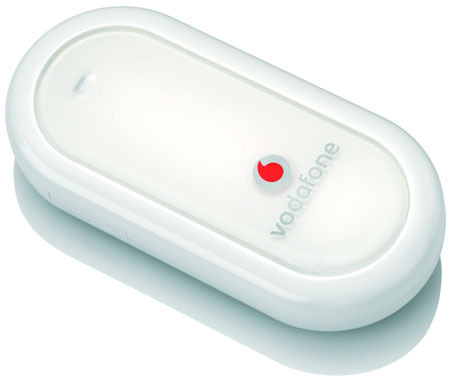 Mobile Connect won't run when the modem's connected, but after you have disconnected, you can run the Vodafone app to choose whether you want to connect only by 3G and HSPDA; by these if available and GPRS if not; or by GPRS only. The first time I tried to connect, I got an authentication error, but I tried again immediately and was logged on quickly. I didn't experience any such problems again.